Look, it is always the width of the page, \\ rather than the width of the figure, can \\ I change this? 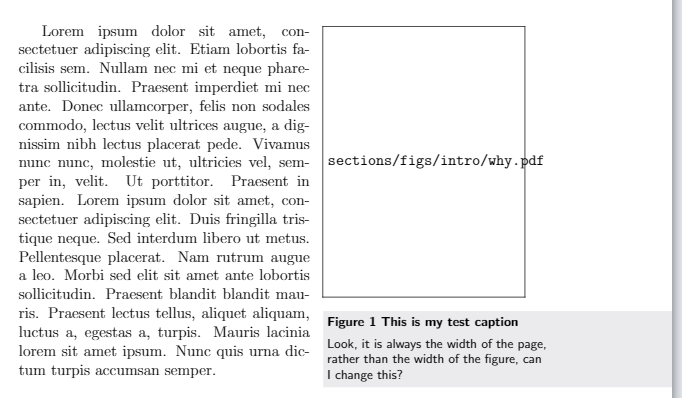 The issue is, that the width of the minipage in the caption, and therefore the width of the whole caption, is set by the linewidth rather than by the figurewidth. Is there some way that I can fix this? Am I going to have to do the caption formatting individually for each figure rather than using caption? I'm sorry if this is something that's been asked before, if it has I couldn't find it. How to remove the word "Figure" from a caption?